The Master of the Magdalen Legend, a painter active in Brussels around the late 15th and early 16th century, was given this name by Friedländer, who also attributed a group of works to this artist. For these attributions Friedländer took as his point of comparison two dismantled panels depicting episodes from the life of the Magdalen, datable to around 1515–20. Sadly, one of these panels, previously in Berlin, was lost in World War II. The other is in the Johnson Collection in the Philadelphia Museum of Art. Following Friedländer, Maquet-Tombu added four further panels to the artist’s hypothetical oeuvre, also basing them on the style of the Magdalen panels. The present small panel, painted on both sides, was formerly in a private collection in Zurich. From there it entered the Andreas Becker collection in Dortmund where it was catalogued as a work by Simon Marmion and the grisaille figure on the reverse described as Saint Victor. As Colin Eisler noted, the painting is difficult to attribute. Since it was first published on the occasion of the exhibition held in Dortmund in 1954, it has been attributed to French and German artists who worked in a Flemish style. Fritz thus suggested it to be a work by the German painter Hinrik Funhof or by Simon Marmion. Eisler finally attributed it with some reservations to the Master of the Magdalen Legend. On the reverse of the panel is a depiction of a man whose highly individualised features have led to the suggestion that this is a portrait. The figure has the most characteristic attribute of Saint Andrew, the x-shaped cross, which he holds with both hands, while a slim halo can be seen around his head. The artist selected a shade of red for the background that makes all the elements of the figure stand out. His face is well drawn and defined, emphasising the eyelids and consequently the blue eyes as well as the particularly prominent nose. This type of depiction in which the sitter is depicted with the symbols of his or her patron saint would become an extremely successful one within the genre of portraiture. 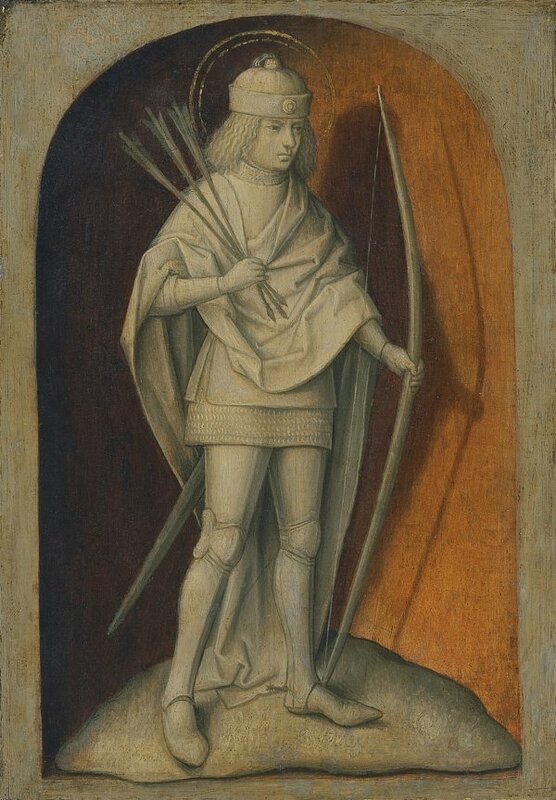 The reverse of the panel has a figure of Saint Sebastian in grisaille, dressed in armour and identifiable by his bow and arrows.